2. a) Discuss the form and subject matter inherent in this piece of work. The work comprises of 5 individual sculptures which are all made from marble and have a resemblance in form. The sculptures are simplified, abstract, stylized, organic and naturalistic. Unnecessary details have been omitted, leaving its basic form and shape. The sculptures have been carved in such a way that they all have a smooth, sinuous continuous flow, giving them a sense of roundness and pleasing fluidity. 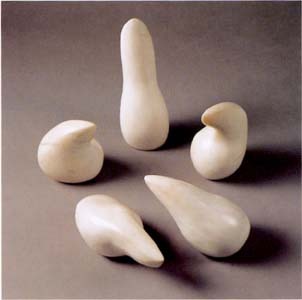 The sculptures are all white, suggesting purity and tenderness of a baby or of nature, in its growing stages. This work encompasses the different changing stages of metamorphosis and growth. The subject matter, due to its pure abstraction and simplification, have become ambiguous and left open for the viewer's free interpretation with guidance from the title of the work. Based on my interpretation, I find that the sculptures represent the different individual stages of growth of a young seedling. The seedlings have an internal force within them, with a sense of organic vitality in them. They seem to be struggling to grow out of the soil and grow into a full young plant. The 2 sculptures which are positioned closer to the viewer are still in its initial stages of growth, struggling to grow out of the soil as suggested by their tips pointing at a very large angle and by the way the forms are positioned - slanting towards the ground in an angle such that the forms are almost placed horizontally. This shows that they have yet to grow and are struggling to stand up. The next two sculptures are standing up, vertically placed but their tips are curled inwards, suggesting the notion that it is still growing. They are vertically shorter and more rounded as compared to the tallest one, so it suggests that they are in the intermediate stage of growth. The way they are curved downwards also suggest delicacy and tenderness, which means that they are still in the process of growing and not fully matured yet, therefore, they need to be protected. The final sculpture at the back is standing tall and straight, suggesting the fact that it has reached its full maturity level and is now standing majestically and strongly. Its tip is fully extended, making it the tallest structure among the 5. The sculptures are also arranged in a circular arrangement, which suggests the cycle of life and how it is endless as the circle suggests the notion of infinity. It may reflect how nature repeats itself in an endless cycle of life, from a seed to an adult plant and back to a seed again. The smooth and white surface of the sculptures suggest the notion of purity and fragility, which may reflect that nature needs to be protected as nature can be easily destroyed by man. The sculptures seem to interact with its surroundings, creating positive and negative spaces among the work. This suggests that the forces of nature are all around us and not apart from us. 2b. With reference to a collection of work by Han Sai Por, discuss how the artist has used this body of work to communicate about man's relationship with nature. Han Sai Por has created series of works in relation to man and nature. These series include Deforestation, Extinction and Destruction. All of these works reflect the notion of nature being destroyed and reflect the cruel remnants of nature left by the man after it is destroyed. Han Sai Por loves nature, and she is saddened by the fact that in Singapore, tropical rainforests and natural vegetation are cruelly removed to make way for the urban Singapore. Nature has been replaced by the man-made and the raw essence of nature is lost as despite replanting trees to replace lost nature, Singapore becomes a "man-made" environment and has lost its beauty of being all natural. She responds to this by creating works which are made out of stone, granite and marble, which are all natural materials, and through this, she wants to portray the notion of man changing nature as she carves the natural forms into her own raw, organic forms. However, she has only sculpted the essentials to stay "loyal" to the material, which resulted in series of works with the basic, abstract and simplified forms, so as to reflect her wish that man would stop destroying nature and preserve it instead. In extinction, one of the works show a pile of white bones being stacked and clustered together. Through this, she is saying that man is destroying nature and if man does not stop destroying nature, he will in turn destroy himself too. The pile of bones represent the extinction of nature and man. The bones are pure white, which reflects the notion that if man does not stop destroying nature, nature will lose its raw colours, essence and vitality. In the same series, a few works which have forms resembling coral reefs are shown. She aims to say that coral reefs will become extinct soon if man does not stop destroying them and the coral reefs are white too and through this, she aims to say that coral reefs will lose its vitality and become relics of the past if they are not protected. The works are monochromatic and beautifully sculpted so as to bring out the rawness and purity of nature, and to alert man that nature is innocent and should not be destroyed due to man's own selfish desires. In the Deforestation Series, some of the works are black which shows that nature has become ugly and polluted due to man's selfish actions. Some of the works in this series cover over a vast area, showing the seriousness and extensiveness of deforestation. Deforestation has caused the extinction of natural plants and wildlife. So together, deforestation and extinction series serve to bring out the idea that nature must be protected and man should live harmoniously with nature for the sake of nature and man's own survival. 2c. Identify and cite a work by another artist who has also used sculpture as a vehicle to comment on social/political issues in his/her art. Compare this work with 'Growth' both in terms of subject matter and in their use of materials. I would cite Christo's 'Wrapped Coast'. In this work, an entire coast is being wrapped by a huge piece of white cloth and the cloth is tied down to the coast with ropes. This is a site-specific installation which is displayed outside the galleries and the work is actually the gallery itself. This contrasts with 'Growth', which consists 5 miniature sculptures sculptures made of pure white marble, which is placed within the safe confines of the gallery. Wrapped Coast, due to its external location, can interact with its surroundings and the quality of the materials can be changed with the surroundings. For example, it can look different when placed under different lighting and under a stormy day or a sunny day. Its materials(especially the cloth) can be subjected to wear and tear after being displayed for a few weeks. However, Growth, does not experience much changing external conditions as it is situated indoors so it is protected from the wear and tear due to the forces of nature. Materials used in both works are white, reflecting the notion of purity and fragility. Growth only consists of one single material(marble) while Wrapped Coast is more of a mixed media installation(cloth, ropes and the coast itself). Growth is created by carving the material while Wrapped Coast is created by wrapping the cloth over the coast, not changing the material's initial form. Growth comprises of both hard and soft medium (hard - coast, soft - cloth). The size of the sculptures are also different- Growth is small while Wrapped Coast as they have a different subject matter. Both subject matters are abstracted and simplified. Growth's sculptures consists of raw and naturalistic, organic forms while Wrapped Coast has been abstracted, changing a detailed Coast into one that is simplified, removing the details of the coast by covering them. Both works are advocating the artist's love for nature, and both are conveying the message that nature is fragile, beautiful and pure, therefore there is an urgent need to stop destroying and start conserving nature. Christo's work, being temporary, conveys the idea that nature can be ephemeral and can be ultimately destroyed if it is not conserved. Growth,however, serves to bring out the beauty and delicacy of a growing seed and playing more on the soft side of the viewer's emotions. Growth shows a continuous life cycle while Wrapped Coast shows a temporary work which will be removed, thus having a short life cycle. Growth tends to bring out the inner vitality in nature while Wrapped Coast brings out the real truth that nature has to be saved immediately or else it will be demolished and meet its demise, just like how Wrapped Coast is removed after being on displayed for a few weeks. 3a. Discuss the subject matter addressed in these works. In Labourer (Lunch Break), a labourer can be seen in a sitting position, taking a break from his work. The labourer is wearing simple clothes which look old and worn out, suggesting the idea of modesty and being prudent. He is gazing into the distance, frowning slightly in deep contemplation. His legs are muscular and well-toned, suggesting that he does hard manual labour. His serious gaze and muscles give him an air of respectability as his image reflects one of an honest working man. Even though it is his lunch break, he seems to be thinking, suggesting that he is a serious man. In the background, a samsui woman can be seen eating her lunch. They are in a Chinese looking eating place as suggested by the simplicity of the setting and the rounded wooden table in the background. With reference to the date of the painting and the clothes that the figures are wearing, it suggests that they are local labourers who are working hard to build Singapore and they are the ones who are the first contributors towards modern Singapore. It may seem like an ordinary scene with ordinary people taking a break, but they are the ones who struggled to rebuild Singapore and allowed Singapore to overcome poverty and become urbanised. The slightly worn down infrastructure also reflected the living conditions and infrastructure of Singapore in the 1960s. These figures are brought into light so that people can acknowledge them. The colour scheme is simple and along with the simplicity of the setting and the figures' clothes, it suggests that they are leading a simple, humble but tough life. In Migrant Mother, a mother in her 30s can be seen, with 2 young children huddled together, their faces hidden, resting on their mother's body. The surroundings look old and worn out, in a shabby condition. The mother and children's clothes look torn, old and tattered, suggesting that they live in deep poverty. The mother's chin is resting on her hand, as she is contemplating about her next step in life. She gazes worriedly, as suggested by her contorted facial emotions, into a distance and wonders how she is going to provide for her children in the days to come. The children's faces are hidden, suggesting something negative and and that they may not have a bright future to look forward to. The photograph is in black and white, suggesting the notion of poverty and it brings out the heavy mood that the photograph is intending to portray. The mother has seven children, whom she can hardly provide for due to her current financial conditions, evoking sympathy from the viewers. 3b. Explain the term social realism. Describe the artistic devices employed by the artists that give these works a social realistic quality. Social realism is the depiction of actual conditions that the society lives in and it reflects the reality of society. For works with social realism, viewers are able to access the work and relate to the work quite easily and directly. In Labourer, the artist uses a limited colour scheme which comprises of brown, black, red and white. Most colours are also in darker tones. This serves to bring out the simplicity of the people's lives back then. The proportions are accurate and the scene looks natural and unposed, giving it a photographic quality as the forms are not distorted and exaggerated, suggesting that it is a real scene. This work serves to bring people back to the 1960s and allow people to immerse in the whole situation. The simplicity of the clothes are also a prominent feature of the work. The brushwork is fine and detailed, with no visible brushstrokes, hence portraying each and every form in an accurate manner, so that people can relate to it. The colours are naturally applied, giving it a sense of realism. The artwork also depicts the building of a nation and labourers working hard during the 1960s, which is a very accurate depiction of social reality. The work is simple and non-decorative, suggesting the prudent lives of the society back then, so the viewers can relate to the lifestyle of the society back then and reflect upon the current state of their society. Migrant Mother is a photograph. The medium itself suggests that it is an accurate and truthful depiction of the society back then. In context of this work, in the 1930s, the whole world is suffering from the Great Depression, which has left many people, including the migrant workers, in poverty, and this societal situation is reflected in the work. The mother and her children are in true accurate proportions and there is no sign of distortion in the photograph, so people can easily relate to the mother and empathise with her plight. 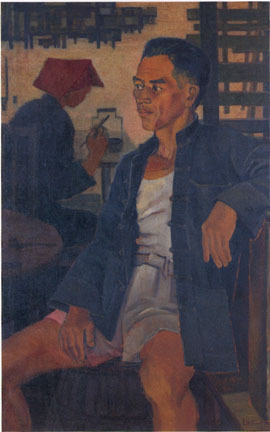 There is no visible brushwork, so this photograph is photorealistic, such that the conditions and challenges faced by the people portrayed by the photograph can be effectively conveyed. The photograph is not exaggerated and the figures do not look posed but quite natural, bringing across the true situation of the people suffering from the Great Depression. The work is in monochrome, which suggests that the work encapsulates the history of society and the reality of the past. The surroundings have carefully framed the work, bringing the sufferings of the mother to light. The composition also helps the viewers to determine the central focus of the photograph and effectively conveying its message, aided by the composition of the photograph, bringing the suffering migrant mother to attention and reflecting a true societal condition of the past. 3c. In the contemporary environment, young people are bombarded with imagery through the internet and media. In your opinion, which of the two works will best retain its relevance to future generations? I feel that Migrant Mother will best retain its relevance to the future generations. In the modern age, society has been absorbed in imagery of the internet and media, making them ignorant to what happened in the past. Modern media is usually too engrossed in portraying an idealistic Utopian world, but it has hardly brought the sufferings of the past to light. I feel that both works are relevant to remind people of the past and not be complacent because of the wealthy and prosperous society that they are living in now. However, Migrant Mother is more relevant due to is international context as the whole world suffered from the Great Depression. Lunch Break has a more Asian context so not everyone throughout the world can relate to Lunch Break. Migrant Mother brings the incidence of absolute poverty to light as it highlights that poverty is prevalent. The idea of poverty is still applicable in today's context as poverty is still widespread around the world, but the media has failed to publicise this notion. For future generations, they can be reminded of poverty and treasure what they currently have as they have so much more as compared to those living in poverty. This work also serves as a reminder to nations that poverty is still prevalent and corporations and countries should provide aid to those in the impoverished countries. Labourer serves more as a memory for Singaporeans to remember their founding forefathers but it does not apply to the international community. Therefore, not relevant to the international community. 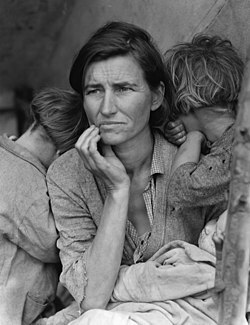 Migrant Mother also comes in a series of photographs, which shows the prevalence of poverty during the Great Depression. The future generations will be more convinced of the incidence of poverty as they get different viewpoints of poverty, whereas Lunch Break is a singular painting which shows only one aspect of nation building in Singapore. Migrant Mother is a photograph, which the future generations can relate more due to the digitalising world. Lunch Break is only a painting and only those in the art world can relate to it. Poverty is a problem which has still yet to be addressed and this work serves as a reminder to future generations not to be complacent and instead, address this prevailing problem instead of being fooled by the media. Ok, so this essay is like the last essay that I will write for an AEP test in NY... ): I have to admit that I kind of like writing AEP essays under exam conditions :O Hard to believe, but that is how I really feel... I think that my brain functions more quickly during AEP exams and a narrative will just continuously flow out under my pen. :) My brain loves to slack when I am typing SOVA blog posts lol and it will only on its full engine during AEP exams. Haha writing AEP essays are nicer than writing IH essays where you have to really follow the question and this restricts creativity and I get mental blocks when I struggle to recall a piece of statistics to chuck in. Somehow, I feel that I do enjoy writing AEP essays, and that helps as I will feel inspired to write. Well, those above are not model answers, but I feel accomplished that I have managed to let this flow out during the exams. Only edited the grammar mistakes though, and I realised that I need to expand my vocab. :/ Shall do that during the holidays. I hope I can write more art essays in the future. (: They are the nicest essays to write(well bio essays are also nice to write).